Today we have the very great pleasure of announcing that the RSL Virtual War Memorial will soon be releasing the complete nominal rolls from the Anglo-Boer War and the Boxer Rebellion. To mark the occasion, Dr. Tony Stimson, President of the South Australian Boer War Association, has generously provided this week's homepage article. The war in South Africa was unlike the Great War 1914-1918. This was not a war between the great powers of Europe in which the fate of the world was at stake. Rather, it was a war between the British Empire and two small republics in southern Africa, the Orange Free State and the South African Republic (Transvaal), dominated by the Boers, a tiny white settler minority of mostly Dutch origin. So why did so many Australians rush to serve in a war fought in a distant land about which they knew very little? It was not as if the Boers threatened Australia. For that matter, it was hard to see how they threatened the British Empire. The total Boer population of the two republics in 1900 was about 270,000, old men, women and children included. But drag on it did. Large, conventional British armies were unable to smash the Boers’ commandos and cope with the hit and run tactics they used after mid 1900. In the mounted horseman equipped with a modern Mauser rifle the army had come up against a highly mobile foe who knew the landscape intimately and would strike hard at British lines of communications before fleeing into the vastness of the veldt. By the end of the war 480,000 British and colonial troops had been committed to this war. This points to one reason why perhaps 25,000 Australians volunteered, the blood tie which saw the predominantly Anglo-Irish population of the Australian colonies rally to the Mother Country in its hour of need. Countless farewells for departing troops touched upon the ‘crimson thread of kinship’ to Mother Britain. Around 1900 Australian loyalties were much more complicated than nowadays. Most people saw no contradiction between shared loyalties to South Australia, Australia and Great Britain. ‘Independent Australian Britons’ was the term one distinguished historian later coined. Loyalty to empire was more of a factor for men from middle class backgrounds and schools like Saint Peter’s College and Prince Alfred College. Out of the 230 men who sailed with the 4th South Australian Imperial Bushmen (4SAIB) in May 1900 no less than 34 came from these two schools. The 3rd contingent of 100 officers and men was in fact raised and paid for by popular subscription, the largest part of the funds being donated by prominent Adelaide men. For men of working class background imperial loyalties probably did not count for much. They were more likely to be motivated by economic drivers for the 1890s were a terrible decade, a time of depression in the cities, the worst before the great Depression of the 1930s, followed by the monstrous turn-of-the-century drought and rural poverty. ‘Why are our volunteers going to the war?’ one writer asked in a letter published in Adelaide’s labour newspaper, The Herald. ‘Not because of their patriotic spirit, but because they are starved out of this country – “beautiful Australia.”’1 Some men enlisted then because of the trooper’s pay and the prospects of high wages for English-speakers once the Boers were defeated and the republics incorporated into the Empire. But in all likelihood the biggest single factor persuading men to enlist was neither patriotism nor employment. I think it was adventure. Batten was one of many in this boat. For young men in their late teens and early to mid 20s, as most troopers were, the war in South Africa offered a rare chance to travel and see exotic lands, all at the Queen’s expense. They knew little of war compared to Australians today, exposed as later generations have been to its horrors since Vietnam burst onto our television screens in the late 1960s. They knew next to nothing of South Africa. In 4SAIB only one trooper, the 30 year old Gordon de Reyher, had been there. The men who sailed from Port Adelaide for South Africa were innocents abroad. Many other factors drove men to enlist. For part-time soldiers in the South Australian Military Forces, and officers in particular, the chance to gain experience by serving in a real war was a big incentive. In Adelaide they could only hope to participate in manoeuvres like the annual Easter camp on Mr. Everard’s farm on what is now Anzac Highway. They would hold mock battles along the city coastline in which they would repel a hypothetical invader, be the invader Russian, French or German, depending on the state of play in international relations. Officers and N.C.O.s in the colonial military forces would form the backbone of the contingents South Australia would send to the war. Others had intensely personal reasons for enlisting. They happened to be in the capital when volunteers were called for a new contingent. Their friends from work or a cycling club were enlisting. Their first cousin in an earlier contingent had written from South Africa saying what fun it all was. A few wanted to escape a shady past. Trooper Michael Wynne seems to have been one. Charged with indecently assaulting a 16 year old girl near Kapunda, he was acquitted when Sir Jenkin Coles spoke on his behalf, but enlisted days later and never returned to Australia. Sergeant Herbert Kekwick, a genial public servant aged 37, was under no such cloud. He loved soldiering in the colony’s military forces but his other passion was cricket. He calculated that if he were demobilized in Capetown he was half way to London and test cricket at Lords. Some married men even wanted to escape the responsibilities of family life, a prospect that so worried the Chief Secretary, J.G. Jenkins, that he told the military authorities in Adelaide to do their best to discourage the enlistment of married men. Colonel Stuart, the Commandant, was horrified. Married men were generally older and a stable influence. He needed them. 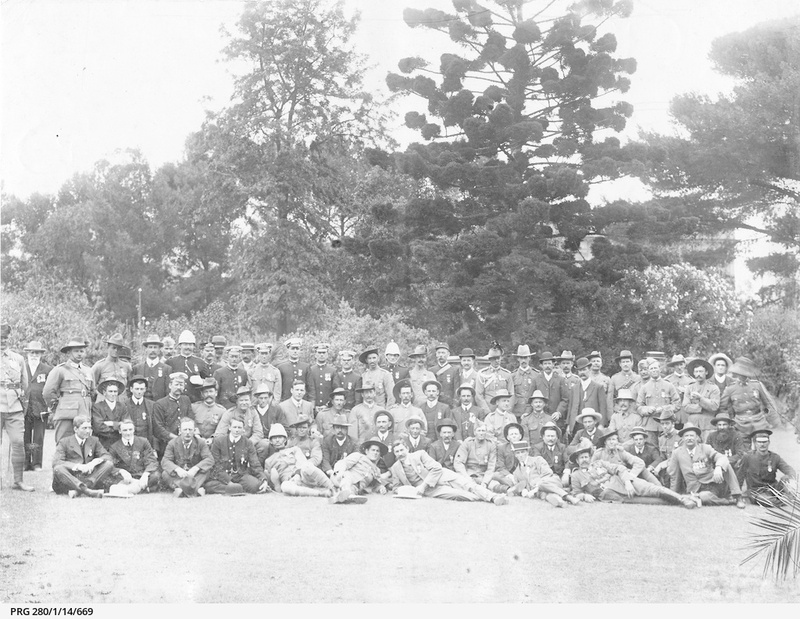 At the training camp at the Old Exhibition Grounds, now part of the University of Adelaide, he lined the married men up, lectured them on their responsibilities and made them sign declarations to the effect that their wives supported their enlistment, and would make no demands on the taxpayer. Each man had his own reasons for going. More than 1,500 men served in South Australian contingents or in contingents raised in this state after Federation on 1 January 1901, and probably half as may again enlisted in units raised in South Africa or elsewhere. There are plenty of examples of men who were so determined to fight that when rejected in Adelaide on various grounds – too short, dubious character, failing the medical or very basic riding and shooting tests - they took ship for South Africa and enlisted there. 2. Tpr. L. Batten to his mother, 4 May 1900, Batten Papers, courtesy of Georgina Batten, Crystal Brook.